It was time to bring one of our most ambitious projects to the NXT level. We remind the main idea, which is to have a GPS-like system composed of several beacons that send out infrared signals together with ultrasonic bursts. The infrared flash of a single beacon almost arrives instantaneously at the robot that is equipped with a combined infrared/ultrasonic receiver. But the ultrasonic signal only arrives with a certain delay, due to the "slow" sound velocity, in comparison to the speed of light. 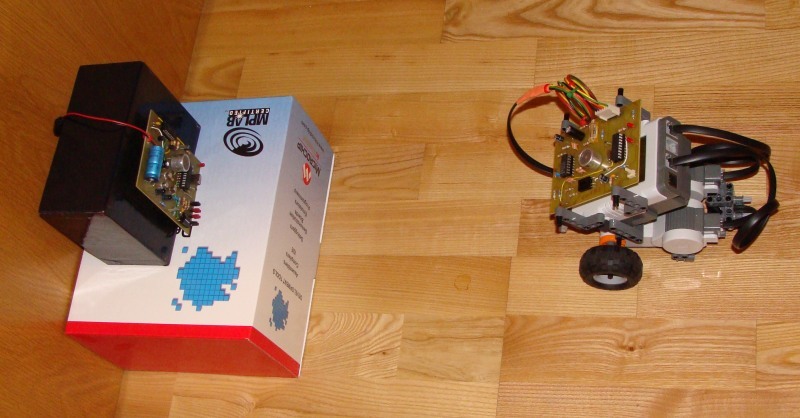 The receiver is able to measure the time lag between both signals and deduce the distance between the robot and the beacon. the master beacon with system ID=0 transmits out a standard RCX compatible IR 0xF7 message. The lower nibble of the message-value is Master_ID# = 0. The higher nibble is the number of participating slaves N_s. (Example: If there are 4 slaves, the message-value will be 0x40.) Note that the beacon doesn't expect any reply on 0xF7 messages, as it also is the case with the RCX. After successful transmission of the IR-message, the master-beacon sends out a short ultrasonic burst of 1.25ms duration at 40kHz. Now the master waits (N_s+1) seconds before restarting the procedure. Then the system waits exactly 1 second, after which the first slave sends out its 0xF7 IR-message. The message-value now is Slave_ID# = 1. After correct IR-transmission, the slave produces a short ultrasonic burst. Any participating robot must be equipped with a receiver. There is no limit for the number of receivers, because the receiver-devices do not interact. The receiver is NXT-compatible. 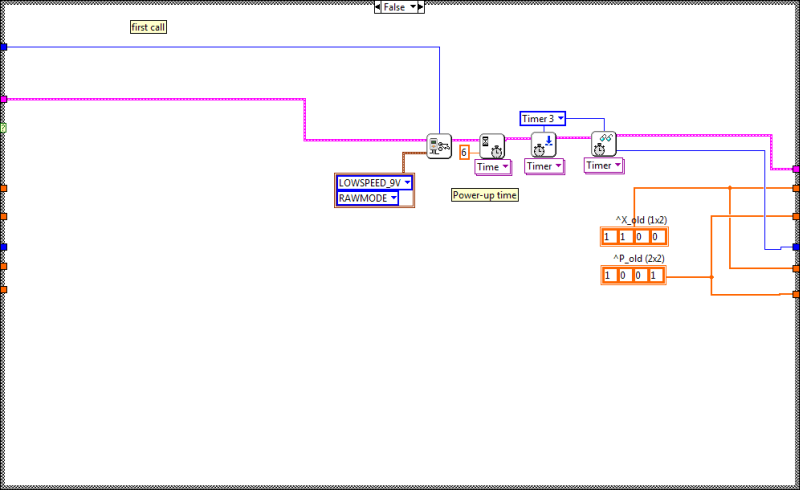 It is powered from the NXT and is configured as aa I2C-slave, answering to NXT requests. If a receiver gets an infrared identification number message from on of the beacons, a timer is started. 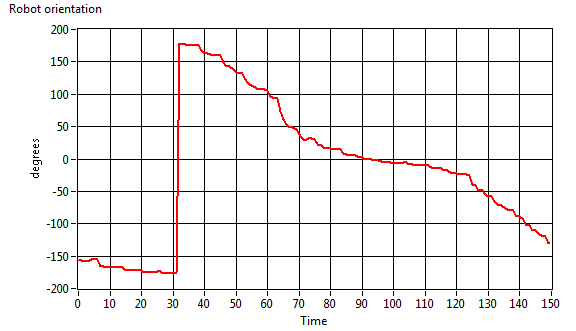 It is stopped, once the ultrasonic burst has been received too, or if a timeout occurred (after about 56ms). 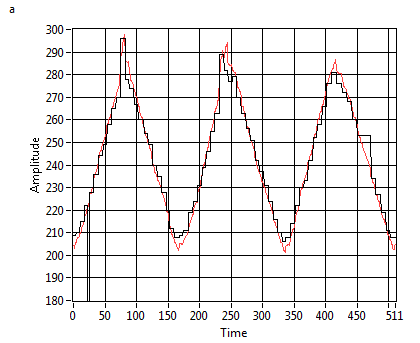 The minimum detectable delay is 0.87 microseconds, which is due to the oscillator clock 18.432MHz and the timer pre-scale of 1:4, one cycle being 4 clock pulses. 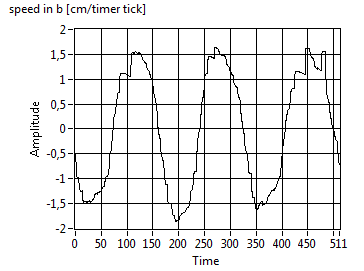 This delay corresponds to a path-length of the ultrasonic signal of x=c*t =343*0.87E-6=0.3mm, assuming that the sound velocity at ambient temperature is 343m/s. The firmware uses a 16bit timer that under the given configuration produces an overflow after 56.88ms, corresponding to a distance of 20m. 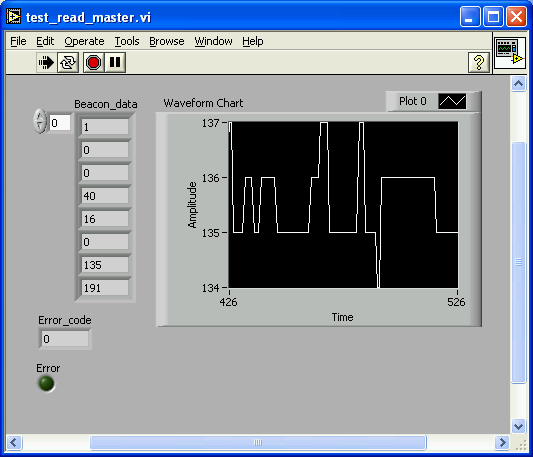 The receiver stores a long message at each measurement event (data-struct see below), composed at this point of the development of non-changeable system information and beacon data. 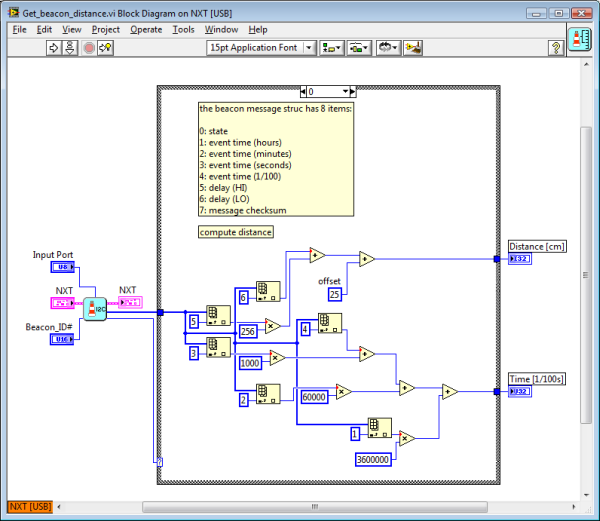 I2C requests from the NXT force the device to return the beacon-data to the NXT-module. Device address is 0x40. The device sends multi-bytes, among which a valid-data-state value, indicating, whether the current data is (or is not) being changed by a new measurement. Further the current device-time of the measurement and the distance in cm (two bytes big endian). The beacon-data packet is completed by a checksum. The beacon_ID#0 data-struct starts at address 0x9 (8 bytes). All other beacon data are at 0x9+8*ID#. fast moving robots need additional dead-reckoning methods fed into a Kalman filter in order to find a best estimate of the position. NXTs must provide the 4.3V AND the 9V power-supply for the receiver-device. 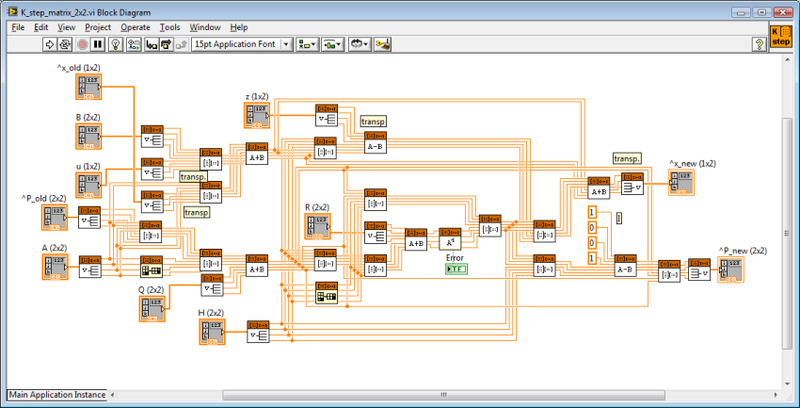 The data is asynchronously retrieved through I2C. Note that, at this point of the development, the time stamp only indicates the time since the start of the receiver. 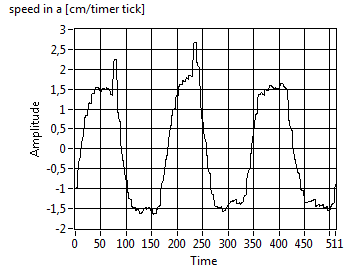 For test reasons, the 16bit timer value that determines the measured distance in maximal 65535 steps of 0.3mm is converted into cm, with an obvious loss of information. These first tests do not distinguish constant errors that are due to the constant offset of the ultrasonic detector, from spurious errors. Future firmware will return the raw 16bit timer value that the NXT can convert into distance through x=c*t.In order to get even more precision, the user could add a temperature sensor that might help fixing the thermo-variable sound velocity. beacon IR-sender: transistors T1/T2 work as a digital AND-function. If the TX line goes LOW, T2 is conducting and the carrier signal switches T3 via T1 powering the IR-LEDs. The circuit assures 100mA fwd current through the LEDs, producing a very high infrared light intensity. The carrier-signal is generated through the PIC16F628 PWM module. beacon ultrasonic sender: the 2x3 IC3 4069N drivers allow sufficiently strong currents through the ultrasonic transducer that oscillate between -16mA and +16mA , thus generating a high ultrasonic signal strength. 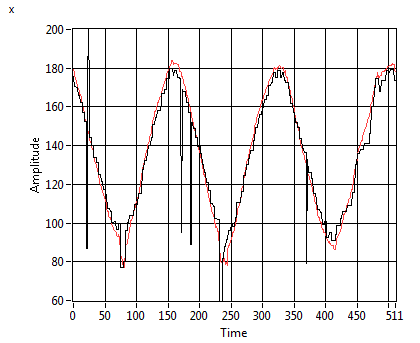 The oscillation at 40kHz is generated through alternating HIGH/LOW states of PIC16F628 RA1/RA2. 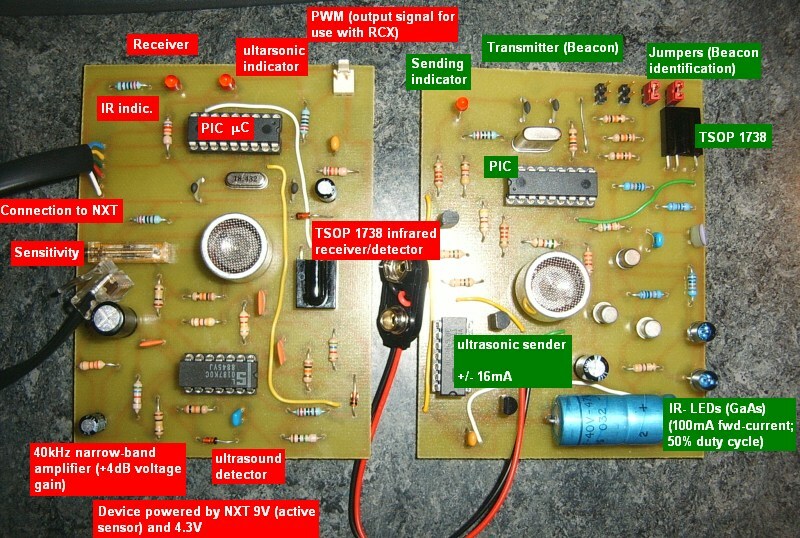 The receiver ultrasonic amplifier has high gain, with a significant maximum at 40kHz. The following signal detector has reaction speed less than 40 microseconds. 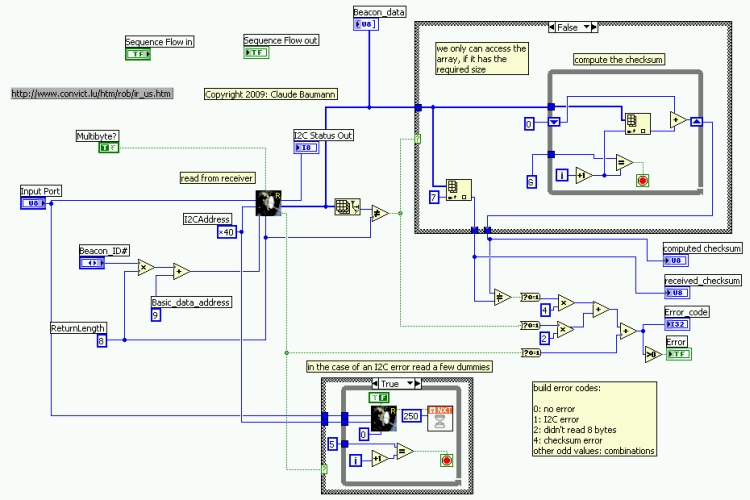 This delay produces an offset that should be taken into account in the evaluation of the distance measurement. The sensitivity of the comparator should be regulated to produce best reaction in the presence of 40kHz ultrasonic signals. Since the sensitivity voltage is proportional to the battery voltage that directly powers the amplifier, the comparator will react similarly at any battery level. 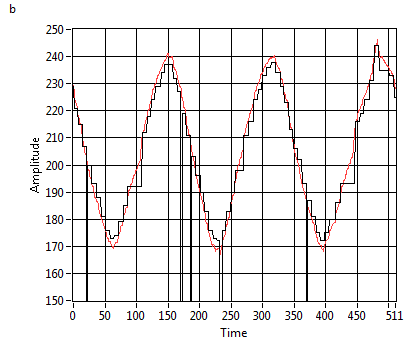 (Regulation of the sensitivity should be done with the volt-meter applied to the output of the comparator. Note : The receiver PWM output does not work in the present firmware. Laurent Kneip suggests that beacon transistor T3 should be added a 200Ohm resistor between collector of T2 and base of T3, in order to prevent too high BE-current. 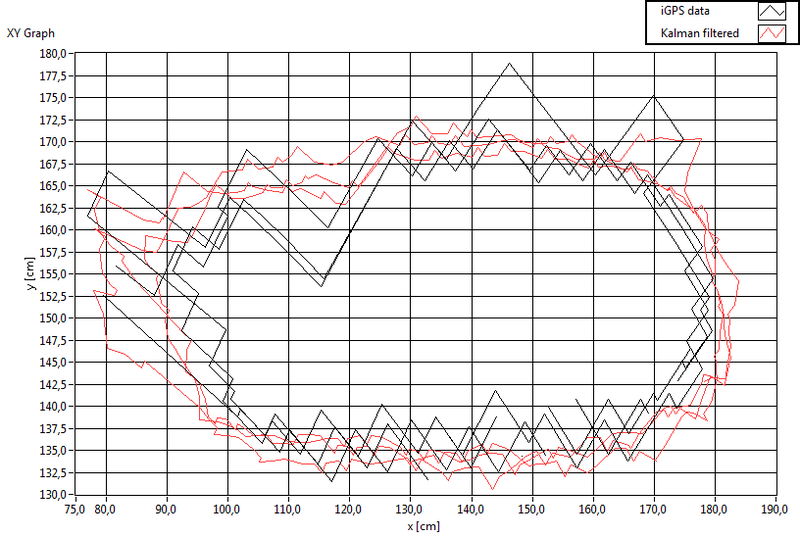 the schematics indicates TSOP1740, which is wrong. The firmware has been realized with ULTIMATE for PICs. if all went well so far the red LED flashes ID# number of times. This firmware shortly flashes the ultrasonic LED signal indicator. If an IR-signal is received, the red IR LED indicator flashes. Only then, if the expected ultrasonic signal is received, the ultrasonic signal flashes. 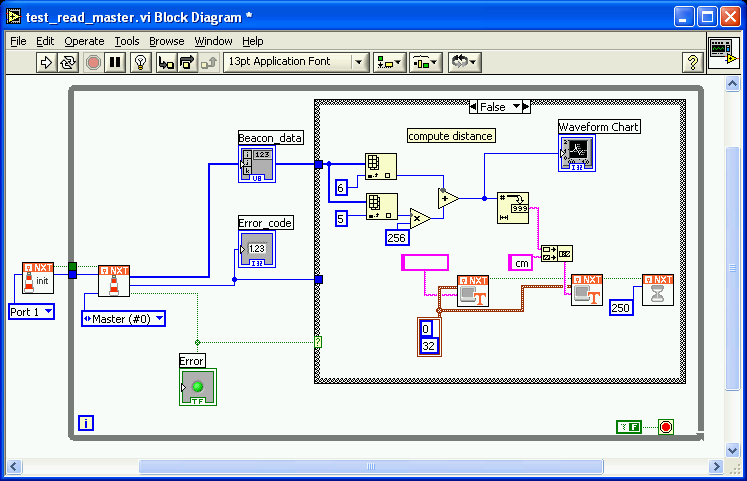 ADDONS 20/02/2009 : The receiver communicates with the NXT via I2C. The PIC16F88 is configured as a slave and allows reliable multi-byte transmission. We got our copy of Michael Gasperi's book "LabVIEW for LEGO Mindstorms NXT". Great job Mike! So, it was time to start playing with the toolkit again. Since this project was still on the workbench, it seemed to be the very first to get the input from the book. 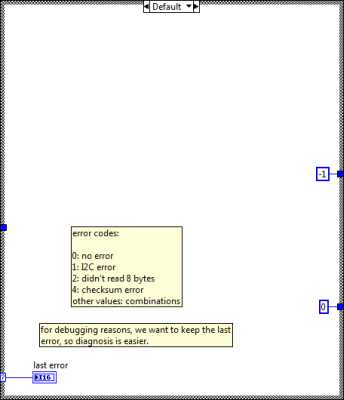 There is a nasty bug that needed a long time to be fixed: in earlier tries, if an error occurred, the program just stopped with the mention on the NXT display: "file error". The reason for it was that through the program we are using dynamic data-arrays that may have zero size in the case of an error. If then we attempt to read at any index, the NXT traps in a fatal error state and stops the program. 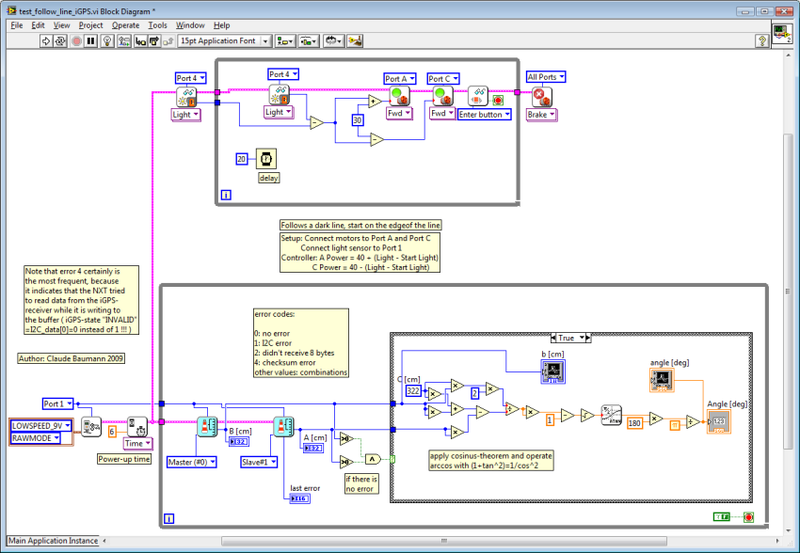 There is no warning or error message in LabVIEW for this event, neither during design-time nor debugging time. (NI guys, consider adding that error message on the PC-screen!!!) We are pretty sure that non-experienced users will seek during extremely long time and desperate here. Mike, could you add a note on your web-site as a complementary instruction to your book? The infrared-ultrasonic beacon-system represents a real global positioning system. Navigating a robot with such a system is as difficult as using a real GPS. 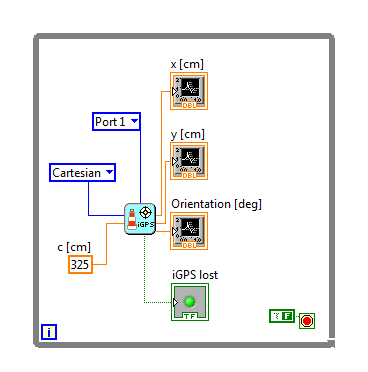 The main issue that we already dealt with while developing our soccer projects -where we used the LEGO camera as global positioning system- is that we receive the GPS-data with a certain delay and at uncertain moments. Normal averaging methods can retrace the robot path, but cannot control it, because they don't tell us the actual position. Here now for the very first time, we are using a scalar Kalman filter for driving a robot on a straight line, where we want the robot to follow a 1D-trajectory. This means that the robot should meet certain target-points at precise moments. 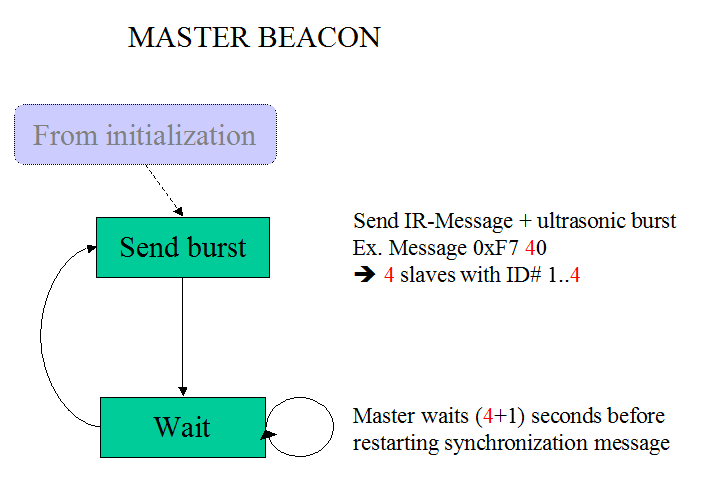 The beacon system uses the Master-beacon alone with the receiver. 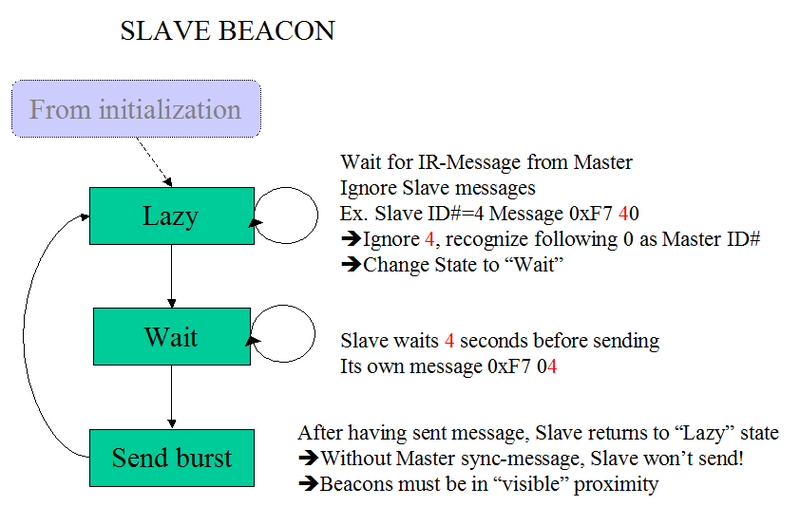 But we configure the Master so that it thinks there was another Slave beacon. By this way, we only send a new update every second. By comparing the received time stamps and verifying GPS-errors (let's denote the system as such), the NXT deduces whether there is a valid update. 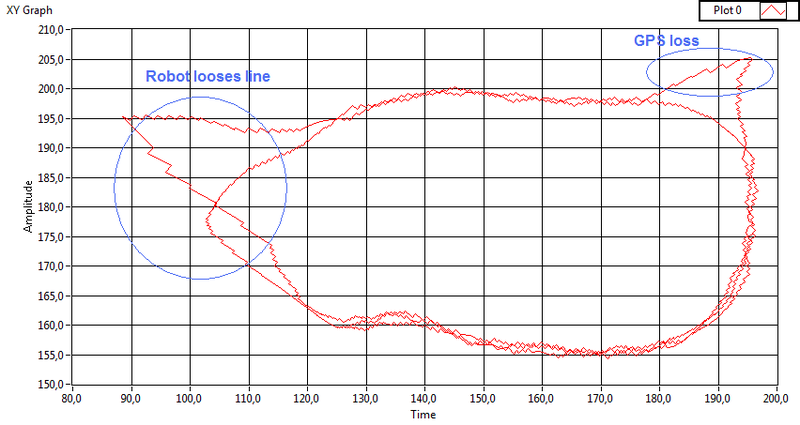 The data is fed into a scalar Kalman filter that we wrote entirely in the LabVIEW toolkit -no matrices were necessary-. 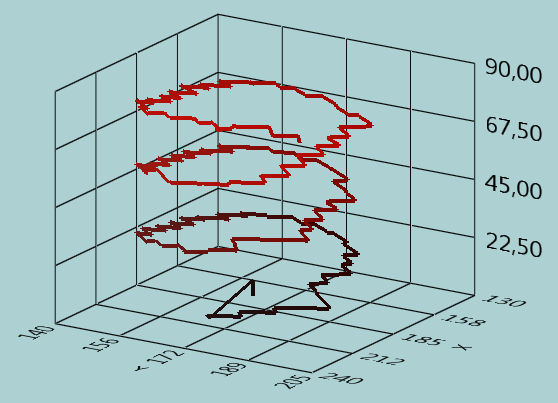 The Kalman filter essentially predicts the robot's position from the sensor data and its internal model of the motion-system. 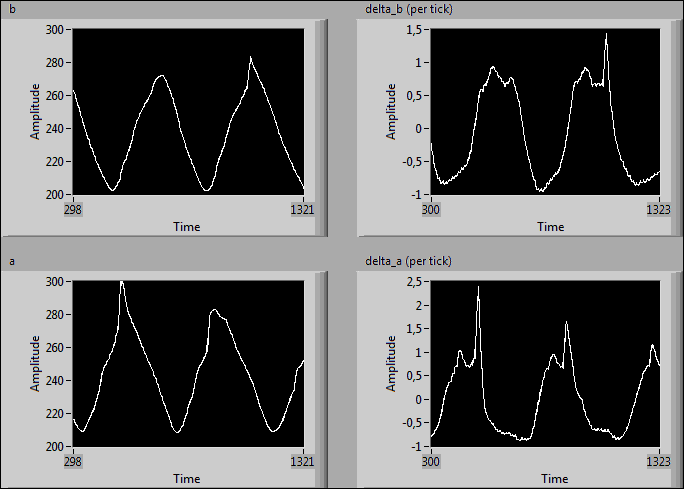 It then compares the prediction with the new sensor-values and adjust the statistics of the positioning-processes and readings. 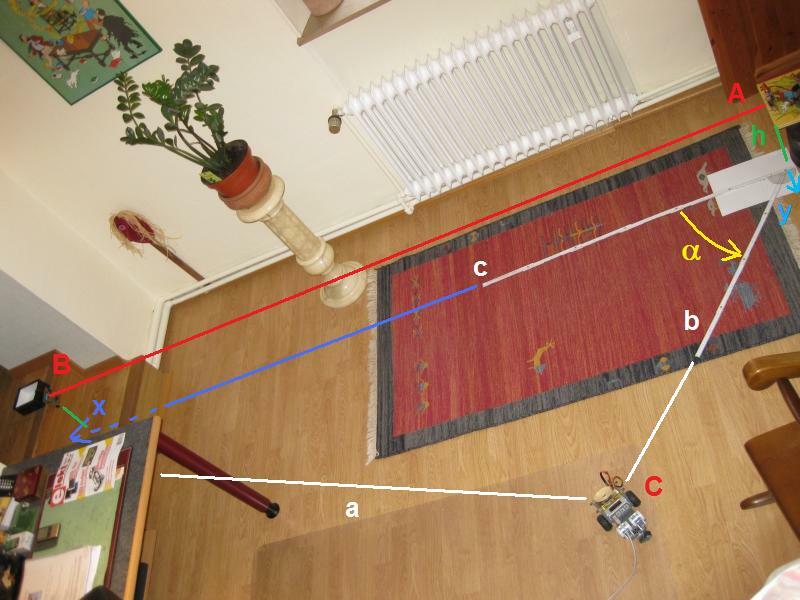 Finally the prediction is corrected to form the very best estimate of the robot's position along the straight line. The motors are controlled from the differences that are noticed between the different target-points and the estimated positions. The program logs the data into a text file from which we extract the results. DOWNLOAD PROGRAM. 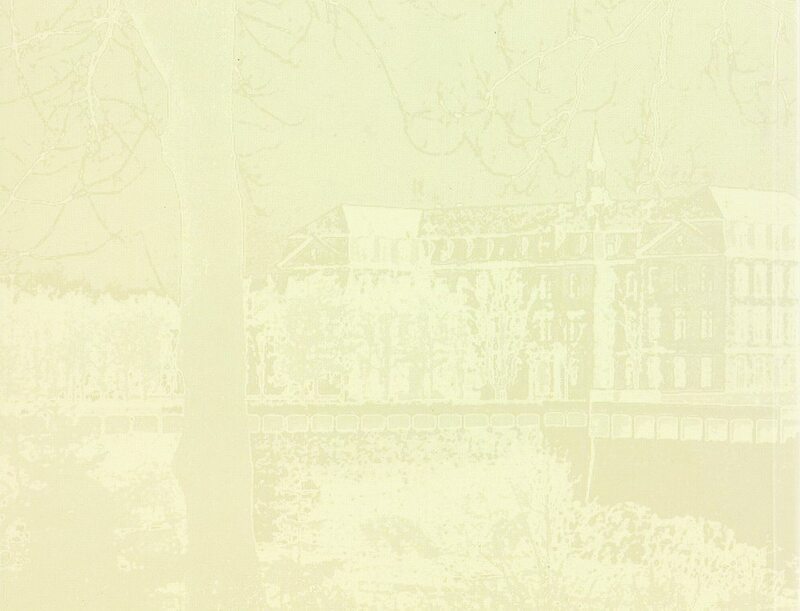 As usual for any Kalman filter, the very first values may diverge from the real values, but they rapidly converge, as can be seen on the picture. 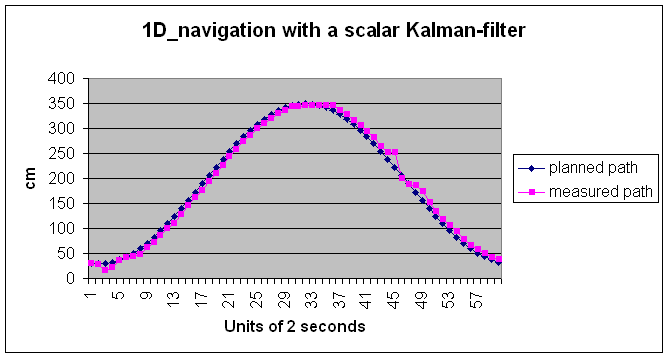 Depending on the filter parameters, the Kalman filter has a more or less rapid response to changes or even errors in the measurement. An error occurred at unit 45 causing the filter to react strongly by increasing the robot's speed. As explained above, the system combines a set of beacons with a NXT compatible receiver. The devices are driven by PIC 16F628 and 16F88 respectively. We have been asked, if we could publish the source code. As it is written in Ultimate for PICs, it represents a graphical code that may be easily understood as a kind of flow-chart programs. For better comprehension we add the beacons' state machines hereby. 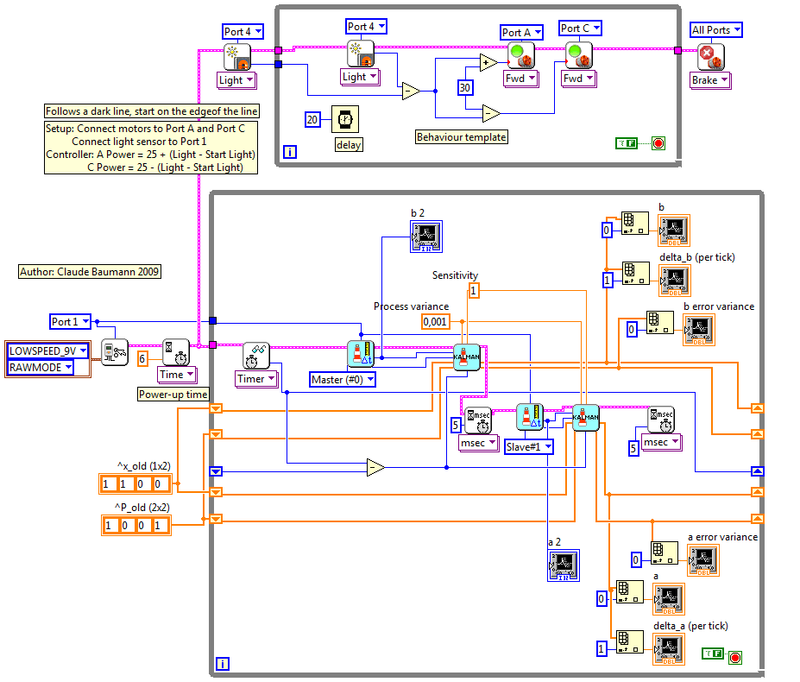 Note that the infrared receiving for the beacons and the receiver works in interrupt mode. This means that as soon as a new serial byte is received, the ISR (interrupt service routine) immediately checks, whether the byte is valid, e.a. that it corresponds to the expected byte. 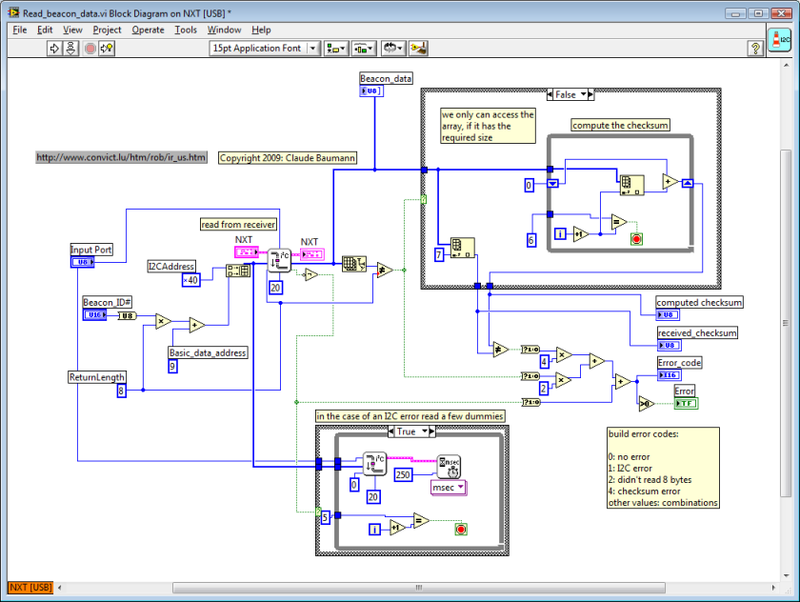 Since the IR channel uses the very robust standard LEGO RCX protocol, each message has a fixed header 0x 55 FF 00, followed by the fixed message code and its complement 0x F7 08. Only then follows the message byte and its complement and the packet checksum plus complement. If at any time the expected byte is missing, the infrared RX channel is reset. The beacons also need the serial TX channel, which is used in back-to-back mode. After the first filling of the TX-output buffer, the TX interrupt is activated. At each interrupt, the buffer is refilled with the next byte, until all have passed. 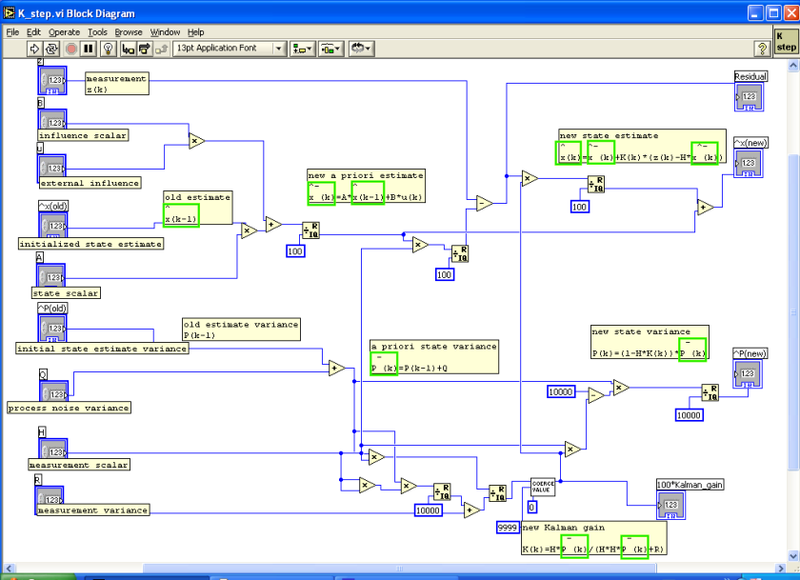 When the first byte is send, the 38kHz infrared carrier is activated (in PWM mode). The carrier only is stopped -and the serial TX interrupt, after two dummy bytes have been filled in the TX, because the otherwise the last two bytes in the PIC hardware buffer would not be covered by the carrier signal. This causes a delay of 2x9x417us=7.5ms (2 bytes, 9 bits, 1/2400 duration per bit) before the ultrasonic burst is sent. The receiver I2C channel is configured in "Slave" mode. The NXT should provide the Master pulse. 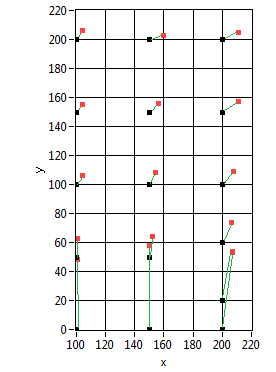 Since we learned that the bit-banged NXT I2C master sometimes gets lost in waiting for a certain ACK that might never come, we decided to verify every 1/100th second, if the state of the I2C channel is hooked somewhere. If it is longer than 5 seconds in the same state, the whole communication modules (also the UART) are reconfigured. This important measure helped reducing the errors to almost zero, even with multi-byte messages. Some minor features still are not implemented. This took quite a long time for the journal to awake. But, here we are again. We finally builded a second beacon, etched the PC-board, soldered the parts, plugged the battery... and without any trouble it immediately worked. The beacon wait-time has been reduced to 250ms instead of 1sec. If the beacons are placed almost in the same plane than the receiver, we recommend adding a reflector to the ultrasonic receiver. (Unfortunately the IR-receiver is shadowed, but this doesn't matter, because the IR-pulses are so striong. We used the LEGO part that LDraw denotes "Dish 8x8 Inverted" (see next picture) and drilled a hole in the middle. 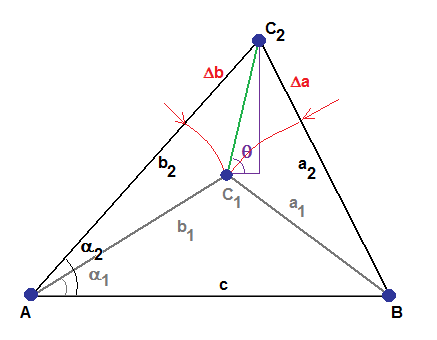 We are able to localize the robot in the plane by applying the cosinus theorem. Note that in the very first test, we deliberately ignore that the beacons height. 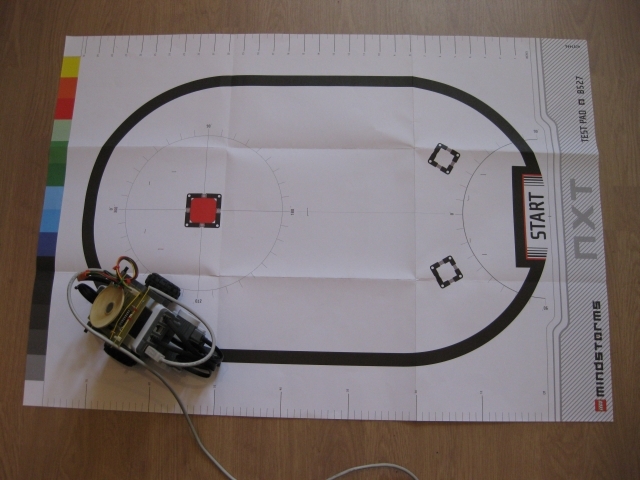 In order to test the reliability of the 2D-localization with the iGPS, we programmed the robot to follow a black line and upload the localization data to the PC. 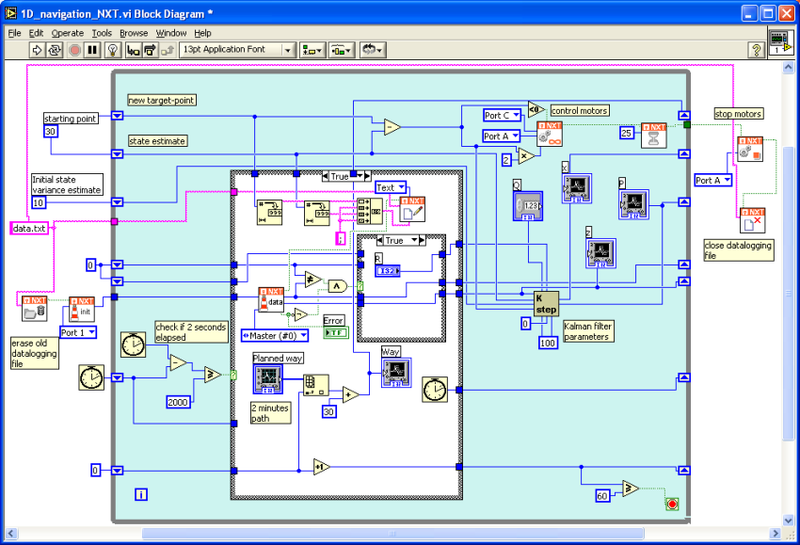 The program was run in debugging mode with the USB-connection. 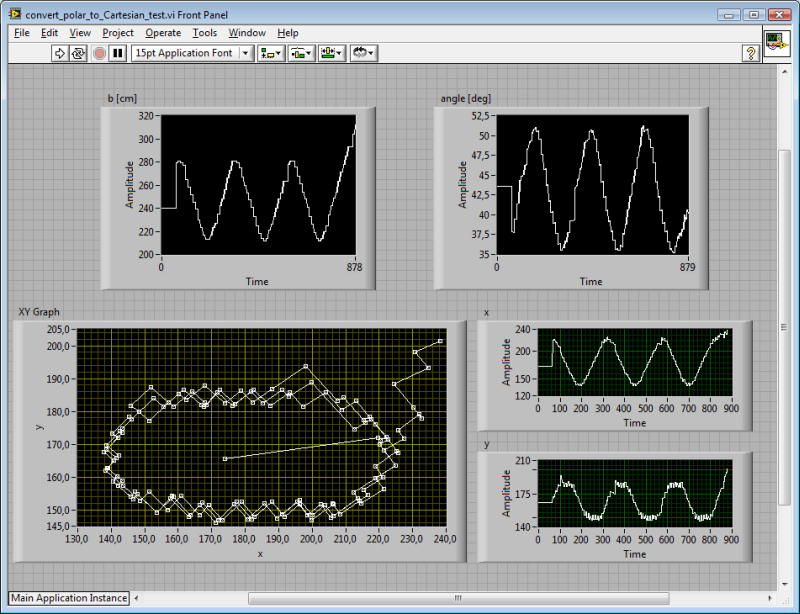 Then we "manually" dragged and dropped the data into a new VI, converted the polar coordinates to Cartesian coordinates and plotted the computed positions. 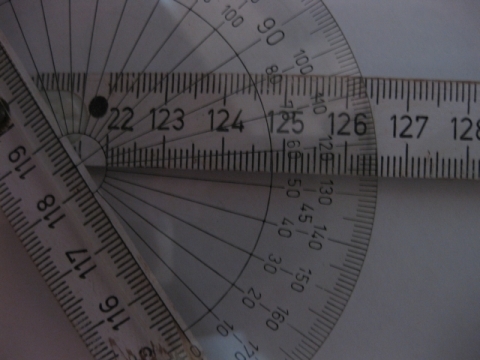 The constant c=322cm was not measured, but just estimated. Its inaccuracy and the fact that we still ignore the height of the beacon locations explain the distortion of the curve. 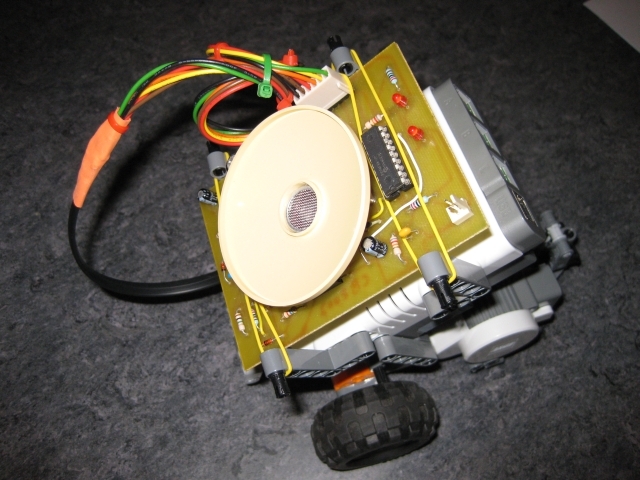 The robot uses the light sensor in order to detect the black line. The algorithm does not produce the usual bang-bang line following, but a very smooth reaction. The last turn, the robot lost the line and went off the oval. We draw a 3D-graph in order to show how the three turns that the robot takes overlay. 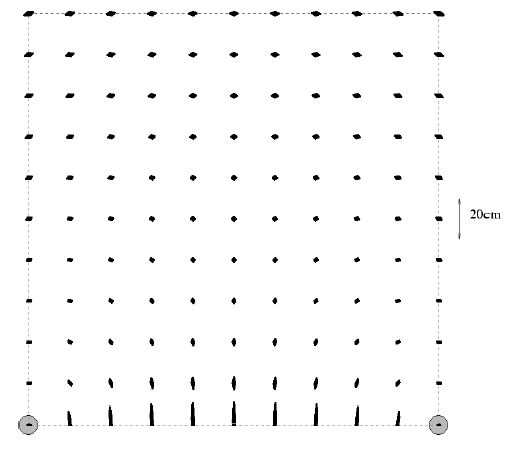 The zig-zag in the line come from the fact that the actual position is only deduced from iGPS data that is off phase by 250ms. By now we have presented the scalar Kalman filter on this site. But, in order to efficiently navigate a robot with our iGPS system, we must this time implement a first order Kalman filter. This implies that we need to build a matrix-based filter that is able to describe the process as a state-space model with a state variable that is composed of a process variable and its derivate. The Kalman filter step function is limited to first order state space models and thus uses 2x2 matrices. This equation suggests that the derivate does not change over time, which in reality is not true. Yet for the moment we will ignore that the process suffers from disturbances and is not submitted to control. and where v(k) is the measurement noise. Note that the product of a horizontal vector with a vertical vector is a scalar and the noise v(k) has the same dimension. Q describes the process covariance. In the present example, the robot movement is part of the process noise, because in the equation above, we didn't add any control variable. In fact, B and u(k) are always zero in our example. Q and P have the dimension 2x2. We assume that the noise of the position and the speed are not correlated (which is obviously wrong, because any disturbance in the speed also changes the position and vice-versa.). Therefore the non-diagonal matrix elements are set to zero. Why such an assumption then? Q is one of the most important parameters of the Kalman filter. As Q gets smaller compared to the measurement variance R, the Kalman filter believes more the model than the measurement. Anyway, during the process, the error covariance, which is a fusion of the process covariance and the measurement variance, will show that the errors in position and in speed are correlated. The dimension of the Kalman factor K must be 1x2, because in the Update equation (2) it multiplies with the scalar z(k) . Remember that a few lines ago we underlined that z(k) had dimension 0. We also have seen that the product H.x(k) is a scalar. Hence, R must be a scalar. 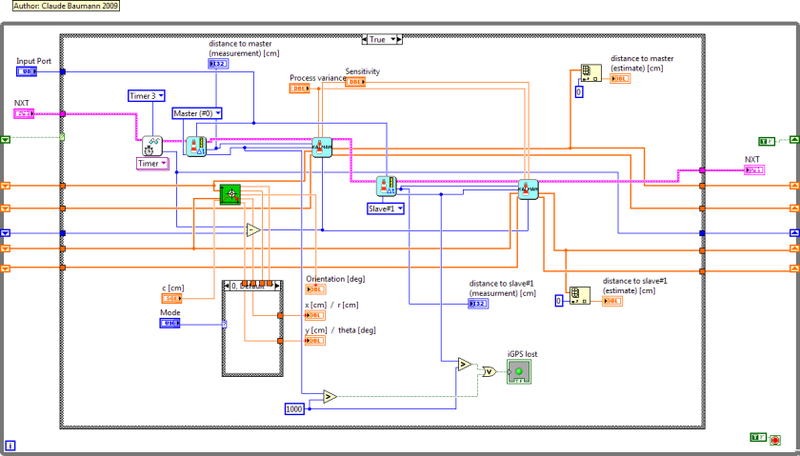 However, the current LabVIEW sub.vi does not verify the dimensions of the matrices. On the contrary, it is programmed to always operate the 2x2 inverse matrix. Therefore it is essential to design R as a 2x2 diagonal matrix with a dummy 1 in the right corner. Otherwise, the inverse matrix function will return an error value. 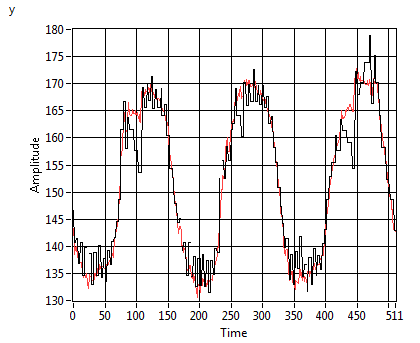 Here the first order Kalman filter step function. It looks impressively complex, but its execution only takes 15ms on the LEGO NXT, which must be considered as excellent timing. 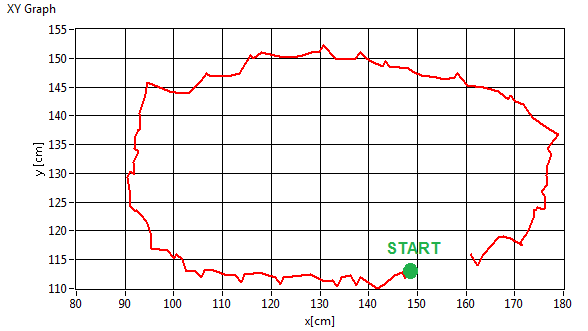 And the iGPS navigation program changes to the following diagram. Notice that we increase the variance R, if the iGPS data is invalid. The high variance tells the filter to ignore the last measurement. The reaction of the filter is very impressive. We could improve it, if we dynamically increased the sensor variance, as the duration from the last valid measurement increases. It is astonishing that the two events, on one hand the robot loosing the line, on the other loosing the iGPS signal, do generate the same kind of error in localization. The difference in reality was that during absence of the iGPS signal, the robot continued moving correctly on the line, whereas the second time, the robot completely went off the line and had to be replaced manually. Without any other knowledge, from the data alone, we cannot distinguish both cases. But, the loss of the iGPS signal can be compensated, if we add a second sensor to the system. We try to improve the data by dynamically adapting the measurement variance in function of the elapsed time since the last correct reading of a beacon value. 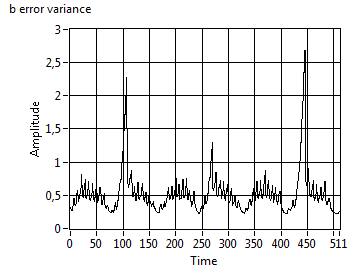 The following xy-plot is the result of a very small process variance Q=0.0001. Remember that this value, compared to R=1 indicates that the Kalman filter should believe more -but not explusively- the model prediction than the sensor reading. We now use another iGPS sub.vi that returns the distance to the beacon and, for each beacon, the elapsed time in milliseconds since the last valid data. Obviously, if we have a valid measurement at a certain moment, we will have to wait 500ms, until the beacon sends again. During that time, the robot will displace by about 3cm and the sensor value that enters the Kalman filter has worse variance. Therefore, the iGPS Kalman filter function computes the travelled distance since the last beacon update and increases the measurement variance R accordingly. Now, the filter error variance is no longer fixed to the convergence value, but changes over time. In the next example, the resulting graph is less smooth, because we tolerated a higher process variance. 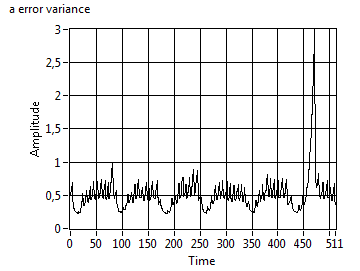 Note the additional variable "Sensitivity", that is a scale factor for the influence of the elapsed time since the last valid data. If the variance of the orientation is needed, the program should include the calculation of two discrete derivates and apply the error propagation formula for variances. For it was possible to run the device with approximate beacon positions. Also we corrected the offset by a constant (25cm that we tried to explain above - probably we were wrong in the interpretion). We noticed that weak beacon 9V block-batteries have an effect on the offset, although the receiver is stable for beacon battery voltages down to 8,3V. Below this value, the offset grows. The NXT voltage does not affect the readings. We took off the plastic reflector, because we found that the shadow on the IR-receiver was too bad and also increased the offset. The offset is slightly dependent on the distance. So, we add a correction function to the main distance extractor VI. (d=1.0191*x+4.2133). The standard deviation never exceeds 1 [cm] both in x and y. 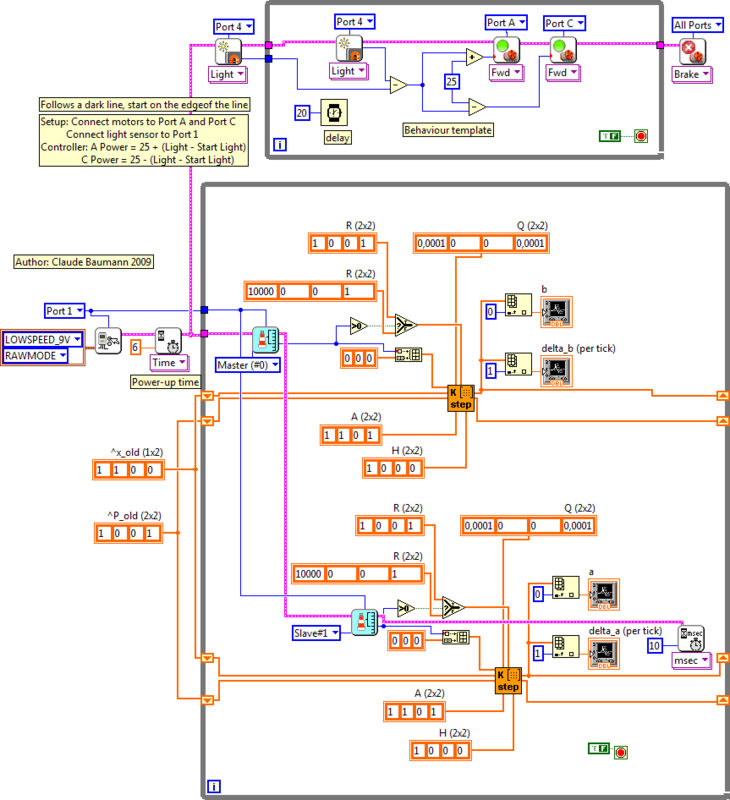 The graph is very similar to the thoroughful study of the Höhrmann's project, from which we pick the error-graph of a simulation with a two-beacon scenario. Conclusions: The results can be improved, if the Kalman filter is tuned. This however may take quite a long time. beacon at 2m height, receiver horizontal: maximal distance 5.70m ==> might be an idea to rethink about using a reflector; but the plastic reflector above hides the IR-receiver!!! The team will build 2 more beacons. So, there will be 4 and complete 3D-positioning will be possible.